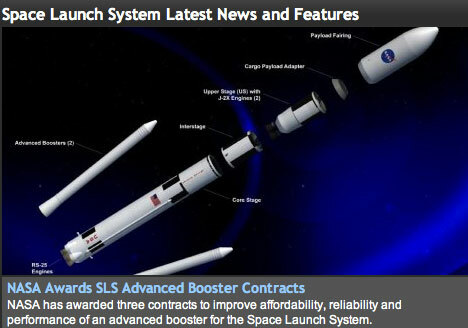 NASA has awarded three contracts totaling $137.3 million to improve the affordability, reliability and performance of an advanced booster for the Space Launch System (SLS). The awardees will develop engineering demonstrations and risk reduction concepts for a future version of the SLS, a heavy-lift rocket that will provide an entirely new capability for human exploration beyond low Earth orbit. The initial 77-ton (70-metric-ton) SLS configuration will use two 5-segment solid rocket boosters similar to the boosters that helped power the space shuttle to orbit. The evolved 143-ton (130-metric-ton) SLS vehicle will require an advanced booster with more thrust than any existing U.S. liquid- or solid-fueled boosters. These new initiatives will demonstrate and examine advanced booster concepts and hardware demonstrations during a 30-month period. — Dynetics Inc. of Huntsville, Alabama, which will demonstrate the use of modern manufacturing techniques to produce and test several primary components of the F-1 rocket engine originally developed for the Apollo Program, including an integrated powerpack, the primary rotating machinery of the engine. Additionally, the contract will demonstrate innovative fabrication techniques for metallic cryogenic tanks. — Northrop Grumman Corporation Aerospace Systems of Redondo Beach, California, which will demonstrate innovative design and manufacturing techniques for composite propellant tanks with low fixed costs and affordable production rates. Independent time and motion studies will compare demonstration affordability data to SLS advanced booster development, production and operations. Designed to be flexible for launching payloads and spacecraft, including NASA's Orion spacecraft that will take humans beyond low Earth orbit, SLS will enable the agency to meet the Obama Administration's goal of sending humans to an asteroid by 2025 and to Mars in the 2030s. The first flight test of NASA's SLS, an uncrewed mission to lunar orbit, which will feature a configuration for a 77-ton lift capacity, is scheduled for 2017. As SLS evolves, a two-stage launch vehicle configuration will provide a lift capability of 143 tons and include the improved, more powerful advanced booster. As NASA endeavors to send humans to a range of new destinations, agency initiatives are helping develop a U.S. commercial space transportation industry with the goal of achieving safe, reliable and cost-effective transportation to and from the International Space Station and low Earth orbit. Ongoing advances made by NASA's commercial space partners are paving the way for regular contract flights of cargo to the space station and marking progress toward a launch of astronauts from U.S. soil in the next five years. NASA's Marshall Space Flight Center in Huntsville, Ala. manages the SLS Program for the agency. SLS will launch from NASA's Kennedy Space Center in Florida.